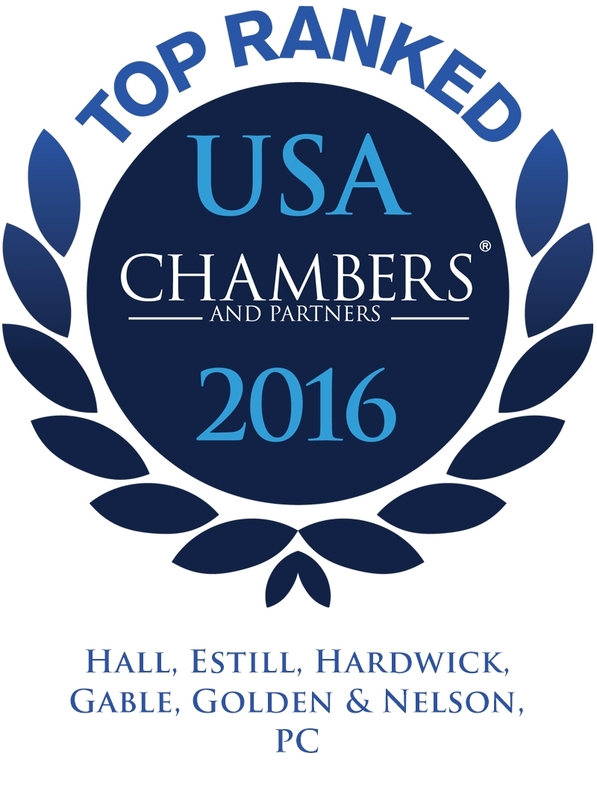 TULSA, Okla. (May 27, 2016) – Hall Estill, Oklahoma’s leading law firm with offices in Tulsa, Oklahoma City, northwest Arkansas and Denver has once again received high marks from the respected law firm and attorney ranking guide, Chambers USA. The publication annually ranks law firms and individual attorneys across the country for their legal knowledge and excellence. For the ninth straight year, Hall Estill was ranked in the following practice areas: Corporate, Energy and Natural Resources, General Commercial Litigation, Intellectual Property, and Labor and Employment. Individual Hall Estill attorneys recognized for excellence include: Steven A. Broussard and Elaine R. Turner for Labor and Employment; Mark Banner, James C.T. Hardwick, J. Kevin Hayes, James D. Satrom and Michael E. Smith for Energy and Natural Resources; Philip L. Free Jr., Randall K. McCarthy and Michael H. Smith for Intellectual Property; Robert D. Nelon for General Commercial Litigation; Gregory W. Alberty for Real Estate; and Timothy S. Posey for Native American Law.